Home / Xbox / How to Connect Xbox One Controller to PC? The days when you had to use proprietary drivers to make your super-cool gamepad work with a gaming PC are gone. Yes, you still should use custom drivers if you want to use some special controllers like wheels or flight sticks. If you are not that kind of person and just want to use popular and extremely convenient Xbox One controller with your games, Microsoft made communication between your PC and Xbox One gamepad very simple. 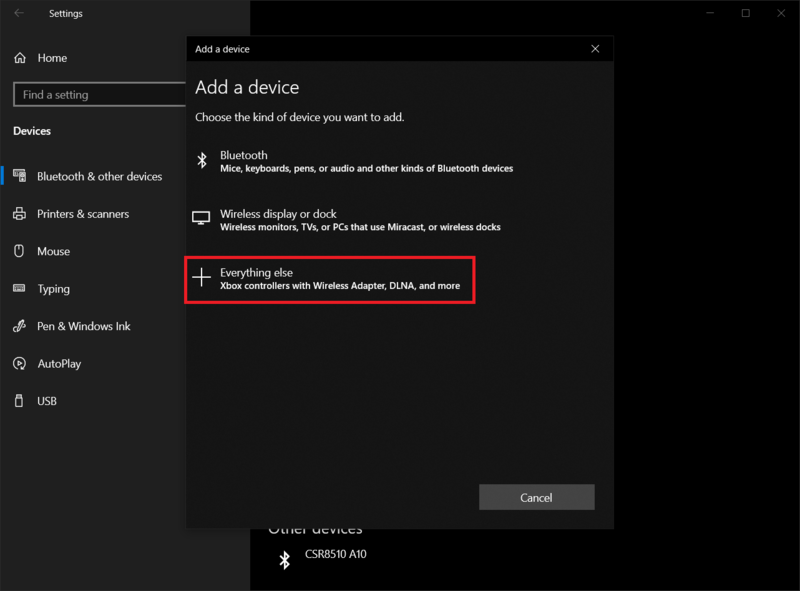 You do not need special drivers or software in order to connect Xbox One Controller to a PC. Yes, there are still some aspects you should consider, but in general Xbox One Controller nowadays works like a charm using “plug-and-play” technology. First, let’s make sure you have an appropriate controller. There are few variants, and some of them are not compatible with PCs. 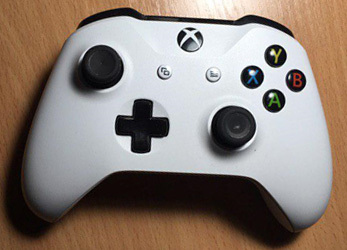 Original Xbox One Controller (2013). Does not work natively with Windows 10 and requires a special dongle, since it uses a proprietary protocol to communicate with consoles and PCs. Microsoft does not sell this controller anymore, yet it works perfectly fine since the day one. Updated Xbox One Controller (2016) with Bluetooth and improved grips. Works natively with Windows 10 PCs via USB-cable or Bluetooth. Still supports the proprietary protocol, thus you can use it with special Xbox Wireless dongle. Most versatile controller, since it works with virtually everything, including your Android-smartphone. Xbox One Elite Gamepad Black (2015) and Xbox One Elite Gamepad White (2018). Just like with OG Xbox One Controllers, it requires an Xbox Wireless adapter to work with a Windows PC. If you are googling something like “my Xbox One controller not connecting”, then you probably have a non-natively gamepad with Windows 10. READ ALSO: How to Calibrate Xbox One Gamepad on Windows 10? 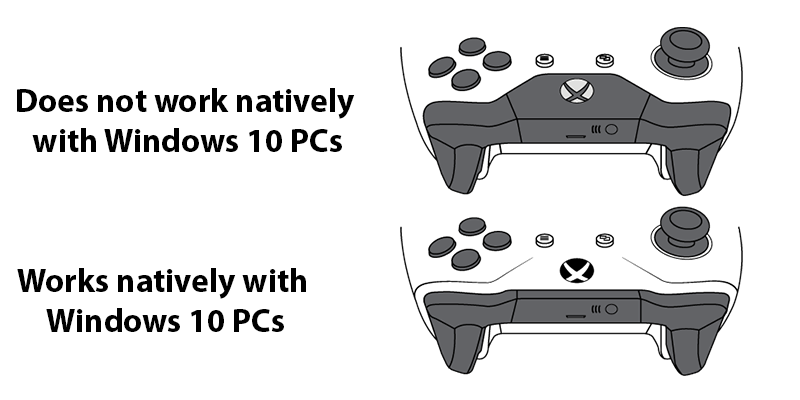 How to know whether an Xbox One Controller is compatible with a PC? Just look at the picture below and you will get the idea on how to distinguish an old Gamepad from the new one which has a Bluetooth. If you have an OG Xbox One Controller or an Xbox One Elite Gamepad, you should buy the Xbox Wireless adapter. That is your only option. Plug it to your PC and press the connect button at the side of the adapter. You will see a little blinking LED on the top of the dongle. Note, that you do not need a driver in order to make the adapter work. As soon as you have a Windows 10 PC, just plug it in, and you are good to go. Now grab your gamepad and press the Xbox button. Next, press the Xbox One sync button on a back of gamepad and wait until Xbox logo begins blinking quickly. A connection will establish in a second or two. 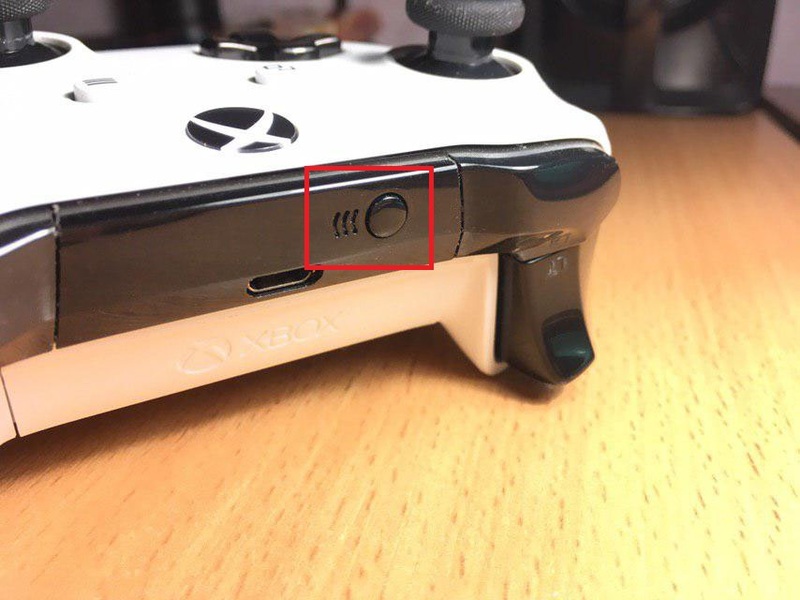 After it is done, the Xbox button will stop blinking. Now your gamepad is ready to rock. 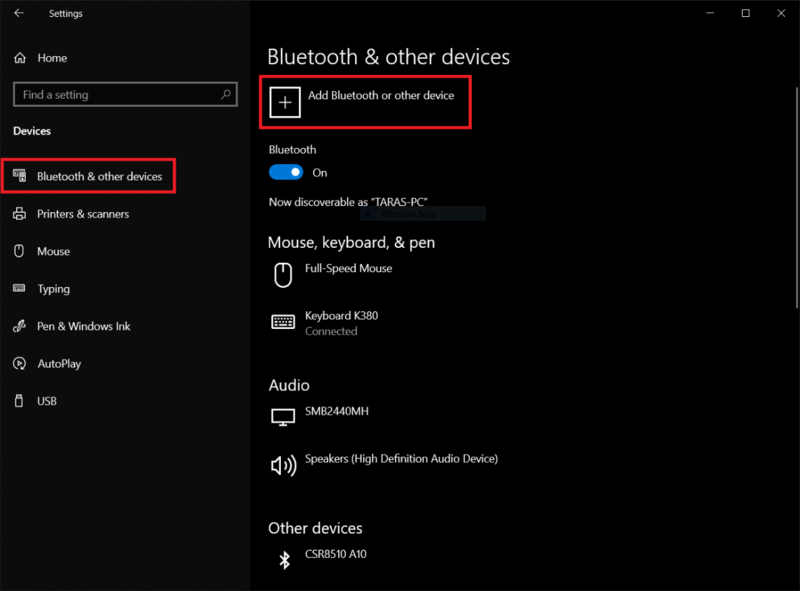 If an Xbox One Gamepad is not connecting, open Settings > Devices and click Add Bluetooth or other device. Press Everything else and wait until your gamepad appears in the list. Click it and you are done. If you have a modern Gamepad, check whether your PC has Bluetooth. If it does not, use a micro USB—USB cable to connect Xbox One Gamepad to PC. Windows will set up everything, so you won’t have to install drivers manually. Just wait until you see a confirmation that a Gamepad is ready to work. You can plug Xbox One Gamepad to PC on Windows 7, Windows 8/8.1 and Windows 10. READ ALSO: How to Connect Xbox One Controller to Mac? Tip. You can use a wired connection even if there are no batteries inside your gamepad. Very convenient if batteries died in the middle of intense gameplay. 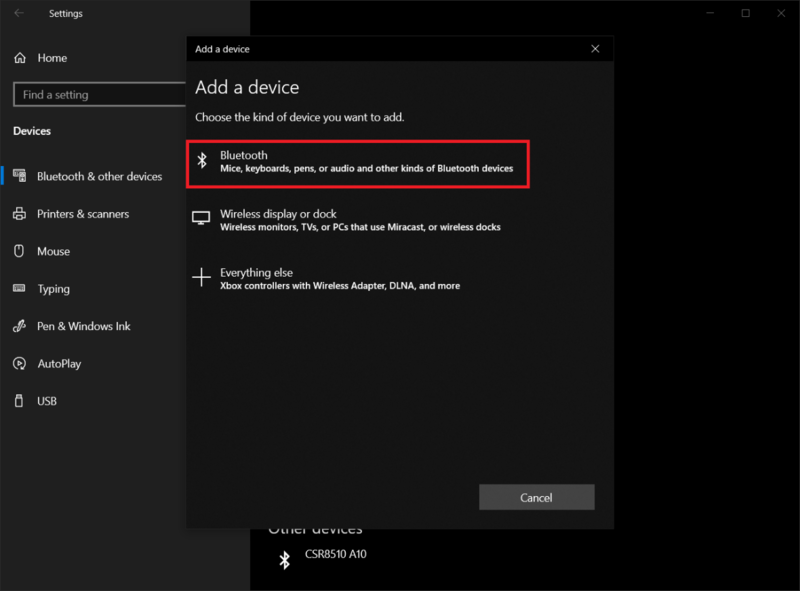 Xbox One Gamepad does not support wireless Bluetooth connection with a PC on Windows 7 and Windows 8/8.1. You should use Windows 10 only. Make sure Bluetooth is turned on. Press the Xbox logo on a Gamepad and hold the Xbox One sync button. Xbox button should start blinking. Now grab your PC and press Win + I > go to Devices > Bluetooth & other Devices. Press Add Bluetooth or another device. Select Bluetooth and wait until your Gamepad will appear in the device list. It may show up as an “Xbox Wireless Controller” or just “Controller”. Click it and you are good to go. That is all. Enjoy playing games on a Windows 10 PC using beloved Xbox One Gamepad!